Energy market « Global Market Insights, Inc. 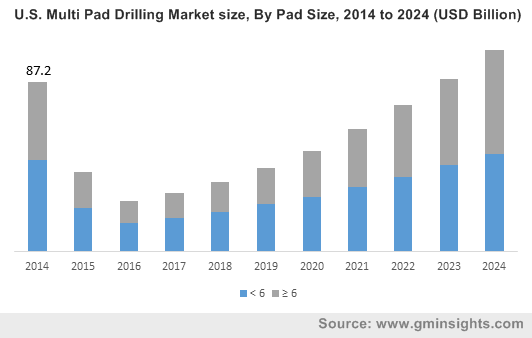 This entry was posted in OIL AND GAS and tagged Energy market, Multi Pad Drilling, Multi Pad Drilling Market, Multi Pad Drilling Market Analysis, Multi Pad Drilling Market Outlook, Multi Pad Drilling Market PDF, Multi Pad Drilling Market Price, Multi Pad Drilling Market Report, Multi Pad Drilling Market Share, Multi Pad Drilling Market Size, Multi Pad Drilling Market Trends. High electricity deficit across rural areas of Africa plus escalating requirement for clean energy will stimulate Africa Off Grid Solar Lighting Market expansion. Nearly, 590 million of the African population, encompassing 130 million urban base, are facing power supply problems. As per Global Market Insights, Inc., “Africa Off Grid Solar Lighting Industry revenue is forecast to hit USD 1.4 billion by 2024.” Furthermore, plummeting prices of off grid renewable energy systems, owing to technological innovations and growing economies of scale are predicted to further drive the industry trends. Even today, a major chunk of the African population depends on non-renewable energy sources such as candles and kerosene, which are responsible for greenhouse effects. 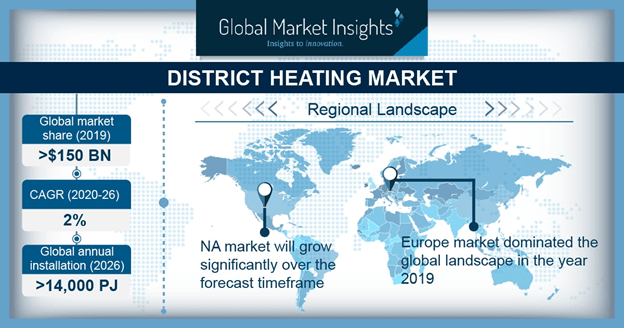 Thus, growing concerns over fossil fuel emissions causing climatic changes as well as fluctuations in seasonal cycles is forecast to benefit market over the years to come. Large Solar Home Systems, Solar Lanterns, and Solar Home Systems are the major products of Africa Off Grid Solar Lighting Industry. Solar Lanterns, which dominated the product landscape in 2015, are predicted to favor Africa Off Grid Solar Lighting market development over the coming years. High urge for inexpensive products and clean energy sources will support the growth. Solar Home Systems are projected to push Africa Off Grid Solar Lighting Market value over the coming seven years, by recording a CAGR of 17% over 2016-2024. High demand for mobiles and smart phones is expected to enhance the popularity of solar home systems. Off Grid Solar Lighting Systems find major applications across Residential, Industrial, and Commercial sectors. 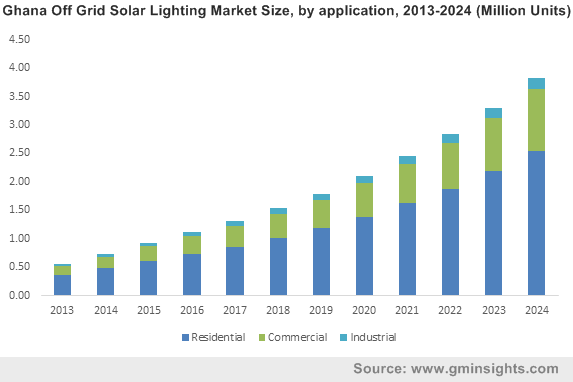 Residential application, worth USD 240 million in 2015, is projected to elevate Africa off grid solar lighting market revenue over the coming timeframe. Growing awareness about the benefits of solar lights usage over kerosene lamps will fuel the growth. Africa Off grid solar lighting market share in the commercial sector is expected to grow at a rate of 16% over the coming seven years, driven by its rising application across retail outlets to promote their business. Industrial application will hit USD 130 million by 2024, driven by continuous power supply demand for small firms to perform everyday business activities/functions. Rwanda off grid solar lighting industry is projected to record a CAGR of 18% over the coming timeframe, driven by favorable government initiatives along with the presence of many retail stores. Kenya industry, which dominated Africa off grid solar lighting market in 2015, is projected to grow substantially over the next few years. Supportive government policies inclusive of incentives, tax benefits, and subsidies will push the regional share. South Africa off grid solar lighting industry will hit USD 65 million by 2024, owing to enhanced use of large solar home systems. Market players will try to increase their ROI through product development, product benchmarking, introduction of new technologies, and heavy R&D investments. SunnyMoney, WakaWaka, Koninklijke Philips N.V., Suntech Power, BBOXX Limited, BareFoot Power, Nuru Light, ASE, and D. Light are the major players of Africa Off Grid Solar Lighting Industry. This entry was posted in ENERGY, MINING, OIL AND GAS and tagged Africa Off Grid Solar Lighting, Africa Off Grid Solar Lighting market, Africa Off Grid Solar Lighting market Analysis, Africa Off Grid Solar Lighting market Growth, Africa Off Grid Solar Lighting market Outlook, Africa Off Grid Solar Lighting market Price, Africa Off Grid Solar Lighting market Report, Africa Off Grid Solar Lighting market Share, Africa Off Grid Solar Lighting market Size, Energy market, Grid Solar Lighting, Off Grid Solar Lighting, Off Grid Solar Lighting market.